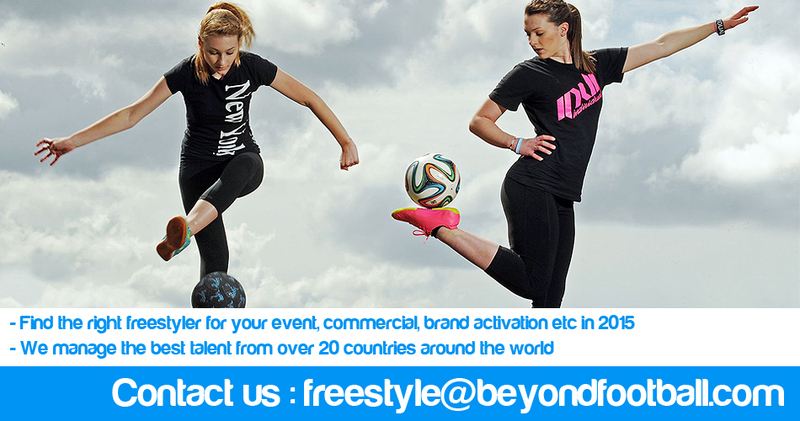 There are hundreds of freestyle football tricks. Sometimes it can be hard to keep up with all of them, so we have created a list of the most popular freestyle soccer tricks. We have them separated by difficulty and have included the names of the tricks, descriptions, and even videos to all of them. A complete revolution around the ball using your foot. As you are juggling, hit the ball with either the inside or outside of the foot (depending on which way you are going around the ball) to give it a bit of a spin. Your foot should make a complete revolution around the ball and come back under the ball to continue juggling. It is perhaps one of the most basic freestyle tricks. Practice is the key. A touch with one foot, and the opposite foot goes around the ball outside to inside and comes around and under to touch the ball, and to continue juggling. A simple but nice looking move. You jump up and swing one leg around the ball while having a trailing leg underneath that leg which kicks the ball up from under the leg you swung around the ball with. The ball is allowed to drop to your standing foot. The other leg swings around over the ball as the ball bounces off the standing foot and comes back up again. Swinging your leg outside to inside is the most common and generally the easier way to perform this trick, however, you can also perform a toe bounce with your leg swinging over the ball inside to outside. Balance is the key. Catch the ball between your feet. One foot (usually the dominant one) rolls the ball up your support leg. Then, with your support leg, bring the backheel up and flick the ball up. Bring your leg up. The ball makes contact with the knee but you also kick out with your foot and the ball kind of pops up from your knee as you pull your foot back. Rest the ball on your foot. The move can be done much easier if you point your toes upwards so you clamp the ball between your foot and your shin. Pound the ball to the ground continuously using the soles of both feet alternatively. It is just as if you would be dribbling a basketball with your hands. There is a groove on your shoulder between your back/neck muscles and collarbone where the ball can rest. However, there are two ways to perform a shoulderstall. One is where you have the ball out in front of you very much similar to a cheststall, and the other is where the ball is out to your side and you are also using the side of your head to hold the ball still. (Follow the same technique for between feet catch) Catch the ball between your legs, about at the height where your knees are. From a neckstall, slightly flick the ball up using your shoulders. Make a complete revolution around the ball with your head and come back around and under the ball to catch it on your neck again. From a neckstall, you slide the ball from off your neck to the side of you while, without a touch, making a revolution around the ball with your leg. This move must be split into two parts. First, brush the edge of the ball with your heel planting your foot in front it. This should cause the ball to flick up and rebound off the top of your heel. After waiting for the ball to rebound adequately, swing back with the same foot and strike it upward. If you execute the second movement too early, the ball will fly behind instead of over you head. Have the ball in a neckstall. From there, swing your upperbody around to bring the ball to a cheststall. Then, get the ball into a neckstall again. The ball follows your upperbody around 360 degrees, hence the name. From neck stall, the ball is touched backwards with the head so that it rests in the middle of your back where there is a ridge which explains the name – in the ditch. from juggling the ball is caught under the t-shirt and hit round using the fist quickly. The ball should spin round your back and fall out of the t-shirt at the front of the body ready to carry on juggling. Just like a htw trick but first you hit the ball up with the knee and then make the other leg come around the ball. Just like a normal atw but the trick is executed with a touch of the heel and then your leg comes around the ball. Balance the ball on the side of your head. Somewhere around the temple you should feel a little groove where the ball could easily be placed. Balance the ball in the area between your eyes, and on the bridge of your nose. Just like a toe bounce but in the opposite direction. Kick the ball up to the outside of you. The foot you will bounce the ball on would come around from underneath the other leg to meet the ball. As the ball makes contact with that foot and you lift your toes to fling it up, your other leg will go over the ball in an inside to outside direction. Juggle the ball with your head. With your leg coming from behind and around your body, touch the ball up with your heel. Spin around and collect the ball to continue juggling, or go into another move as a combo. Consecutive ATW’s. *Put extra spin in each atw! Kick the ball really high in the air. As it comes down jump over the ball so the ball falls and bounces on the ground in between your legs and comes up behind you. Lean back quickly to meet the ball bouncing up with the back of your head, to pound it down to the ground. A more advanced form of the around the world. As you are in the middle of the atw trick, make a slight jump and swing your other foot around as you knock the ball from under that leg. Timing of the jump is the key to mastering this trick. It is almost the same as the tatw trick except there is no touch in the middle of the trick. The trick is performed with the first leg going around like a atw but from the jump you immediately proceed in throwing the other leg around the ball without hitting it up from underneath with the first leg. Almost the same as tatw except with tatw it is almost atw no touch crossover combo while with ktatw the trick is performed with a knee atw first. A trick pioneered by Abbas Farid. It is a complete rewind of the trick tatw. Your first leg hits the ball up. Your other leg goes around the ball inside to outside. Then, you make a jump in which your first leg follows with an atw. A sort of double around the world. You touch the ball to start the around the world trick and move your foot around the ball twice (720 degrees) before making contact with the ball again. 1. Kick the ball up with your right foot. 2. Do an ATW (anti-clockwise) high up in the air with your right foot – almost at the same time lift up your left foot. Your two feet should eventually be off the ground. 3. As soon as you do the ATW (anti-clockwise) in the air your left leg/foot should pass OVER the ball whilst in the air. 4. Land on your right foot – but control the ball with your left. Just like a MATW but the touch in the middle of the trick is exclude. Almost like HT-ATW also but the starting atw is in the inside direction rather than the outside direction. It is a MATW but an inside direction knee atw is used to initiate the trick. You first hit the ball straight up. With the other leg you make an inside to outside rotation around the ball. At the same time you make a jump and swing the other leg around the ball and kick the ball up from underneath that leg. A move pioneered by Palle originally but since he didn’t want a move named after himself he decided to name it after a friend, Jay Ransome from England. It is a tatw but in the end instead of making an inside direction revolution with the other leg, an outside direction revolution is done. A quite awkward move if you have never tried before. A combination move involving the toe bounce, a backheel flick with a spin, and after you have swung around with the spin, a no touch hop the world. Pioneered by Soufiane Touzani in his “Deel Drie”. Touch the ball with your dominant foot. Your non-dominant foot will make an inside to outside rotation around the ball as the ball falls straight back on the dominant foot. And then a tatw is completed. Stall the ball on the sole of your foot while lying down flat on your back. Have the ball in a footstall. Now clamp the ball down real hard and make sure you have a good feel for the ball. Now get down on the ground and start breakdancing, serious! It appears as if the ball is “glued” to your foot and if you have good dance moves like Gerbeshi (the dance instructor) it can look VERY stylish. Almost the same as KTATW but the first touch with the knee is performed with the opposite knee instead. A very difficult and advanced trick. It is a HM-ATW but the starting touch is with the opposite foot. Your first foot touches the ball up. With a jump, your other foot makes a rotation around the ball in the inside direction. Without an extra touch, your first foot also makes an inside direction rotation around the ball before touching the ball with your first foot again. Best explained by viewing the animated image. A very advanced trick. A knee htw is used to initiate the trick with the other leg going over the ball in the end after the knee htw. First an inside direction atw is done in the first part of the trick. Then, with a jump, without hitting it again with the same foot, the other foot goes around the ball in an outside direction and touches the ball. From a neckstall, you slide the ball from off your neck to your side. Then, an AMATW is performed directly without an extra touch from your other foot. also called “the triple” – just like a lemmens around the world but instead of going around the ball twice before touching it again, you go around the ball three times. A very difficult and complex move to perform and only performed so far by a few elite freestylers. It is just like the htw trick but instead of the other leg making a revolution once, it will go around twice without another touch. Start the maneuver as you would any other LATW. When the second rotation around the ball is almost complete, make a jump and throw your other leg around the ball just as you would a tatw. It is the same as above but with the LATW starting in the opposite direction. Pioneered by Tatsulow of Japan. Hold your leg out with your toes pointed down to the ground and heel pointed straight up. Balance the ball on your heel.